From 6am to 3pm, chances are, I will have a drink next to me that has caffeine in it. I like how it makes my brain spin, I like how it raises my spirits, and honestly, it's about the most mild vice one can pick. Coffee is normally my go-to, but lately, half-and-half has been making me feel like crap after the third cup. I decided to start drinking more tea. I love Fast Lane tea by Celestial Seasonings, but recently, this popped up on my Facebook feed. Say what?! 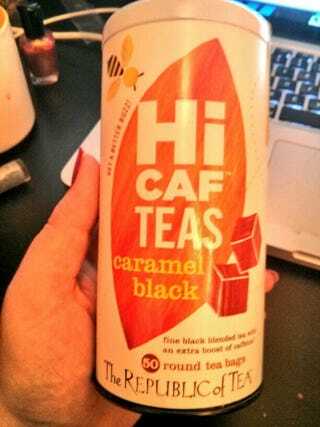 Tea that's highly caffeinated without me having to steep it until it's undrinkable?! Tell me more! I got the coconut one and the caramel one. Today I had a cup of the Caramel Black... and that's it. That's the only drink I've had today, because it was all I needed. It's 4:30, and I'm still totally perky. This stuff is absolutely amazing, and may be my new go-to. Oh, and it tastes great, too. Strong, non-fake caramel smell on the nose and tongue.